This website is based on the guidebook The Glasgow Guide by David Williams which describes walks around some of the most interesting parts of the city. The site describes what is in the book and includes a sample of the text. There is also a link to The Scotland Guide website which includes about 200 pages of illustrated articles about Glasgow. Those articles are based on the text of the guidebook. This Glasgow guidebook can be purchased from Amazon from this page. Find out more about "The Glasgow Guide" guidebook. Read articles about Glasgow in The Scotland Guide website. Buy "The Glasgow Guide" guidebook from Amazon. The Scotland Guide is being developed as an illustrated guide to Scotland. At present the site contains about 200 pages of articles about Glasgow. The Scotland Bookshop is an online bookshop specialising in books about Scotland. This can be used to purchase books from Amazon. The Globe Travel Bookshop is an online bookshop featuring travel books from every country on the globe. 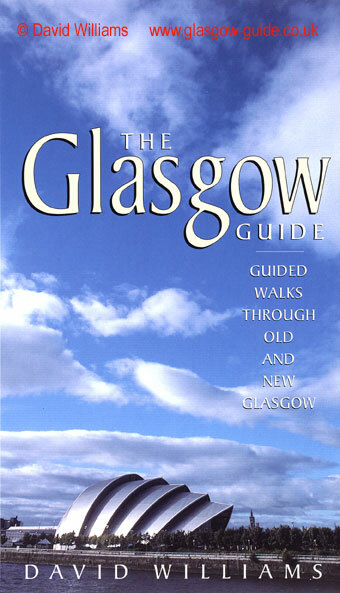 This is the front cover of The Glasgow Guide guidebook. It shows the "Armadillo", a stylish new addition to the Scottish Exhibition and Conference Centre which stands on the north bank of the River Clyde. The rear cover of the book, with information from the publisher.